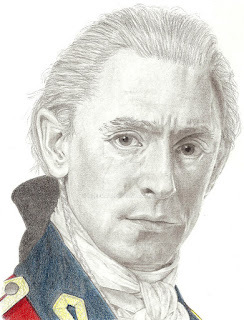 A sketch of JJ Feild as Major John André in AMC's TURN. I have mixed feelings on this one. It's the most time I've spent on a piece yet, and I'm happy with some of the shading; however, I don't think I 100% captured JJ. Still, it's my first time attempting him, so I may try another in the future. Actually, it looks a little more like him in the original than it does on this scan. Scans of my drawings never look quite right compared to how they do on paper for some reason.